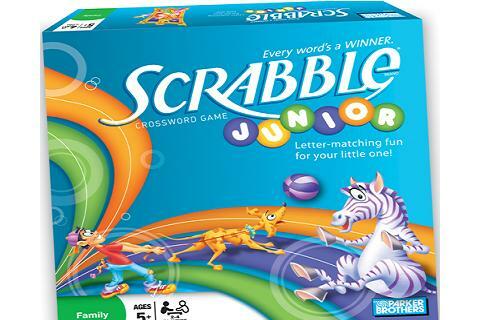  In the Scrabble Junior game, kids match picture words with letter tiles.  Game helps children expand their vocabulary.  Two sided board game, one side for beginners, one side for advanced players. Scrabble Junior is a fun board designed for children ages 5 to 10 that helps children learn new words and expand their vocabulary. What is great about this version of Scrabble is that the board game is two-sided. One side is for beginners and the other side is for more advanced players. Therefore, older children and even adults can also enjoy this game. In Scrabble Junior, kids match picture words with letter tiles. The words are short and the pictures are colorful. Kids collect chips and the player with the most chips win. It contains 101 letter tiles, 44 chips. Beginner and advanced rules are also provided. Overall a fun and educational family board game, good to have at home.